Matheus Taylor didn't ask to be murdered. To be fair, the percentage of people actually asking to be murdered is probably small enough to be safely ignored, but he felt it was worth stating regardless. His life might have been ordinary, but it was his life and he wasn't done with it yet. A 1,700-year-old Roman, Quintus Livius Saturnius had a different view of morality than most people. Killing Matheus and hijacking his undead existence seemed perfectly acceptable to him. Now, Matheus spends his nights running for his life, questioning his sexual orientation, and defying a mysterious new threat to the vampires within his city. Not that he set out to do any defying; he just wanted to be left alone. Unfortunately, that was never going to happen. Fans of Real Vampires Don't Sparkle should be sure to check out more titles from Curiosity Quills Press: Sweet Dreams Are Made of Teeth, by Richard Roberts: a fantasy coming-of-age story set in the world of our dreams, where a nightmare learns who he is - and who he loves. The Devil You Know, by K. H.Koehler: an urban fantasy pulp/mystery series about demons, rogue angels, and a small group of people living in rural northeast Pennsylvania who are caught in the middle of an angelic war. 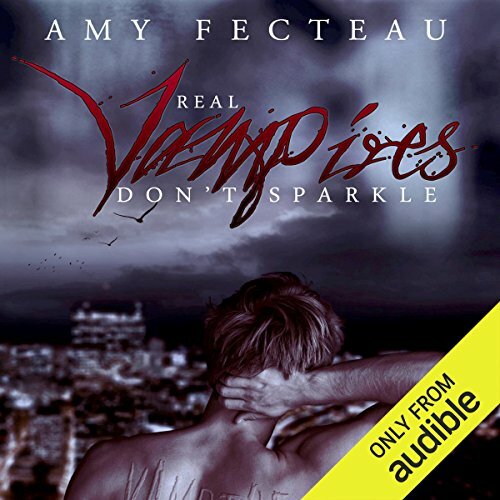 ©2013 Amy Fecteau (P)2013 Audible Inc.
Matheus Taylor didn't ask to be murdered. To be fair, the percentage of people actually asking to be murdered is probably small enough to be safely ignored, but he felt it was worth stating regardless. His life might have been ordinary, but it was his life and he wasn't done with it yet. Quin didn't care. A 1,700-year-old Roman, Quintus Livius Saturnius had a different view of morality than most people. Killing Matheus and hijacking his undead existence seemed perfectly acceptable to him. After his disownment, Matheus finds himself more confused than ever. He lashes out, losing Quin, the one constant presence in his new life. Alone, penniless, and clueless, Matheus is forced to carve out a new (un)life, amid the chaos of a hidden war. Friends and enemies, old and new, appear with secrets, betrayals, and a surprising revelations. James Patrick Cronin is fabulous as the narrator! Matheus believes that getting Quin back will help him deal with the pressures of a vampiric war, but his hopes crumble after his soulmate fails to remember him. The tattered remnant of their mystical connection appears to drive Quin's erratic suicidal behavior, threatening their bond and their very existence. While Matheus pines for his former love, a hurt and betrayed Alastair must watch the man he loves chase another. Feeling inadequate as a leader, Matheus searches for a way to make Quin remember him, no matter the cost.